1 The first time I saw the farm it was winter. Bitter northern Alberta cold, with air that stings your cheeks and fingers and can feel sharp as a knife's blade. I spent two years convincing Holly to let me come and see her. "It's important," I told her. "It's important people know the truth." Eventually she said yes. 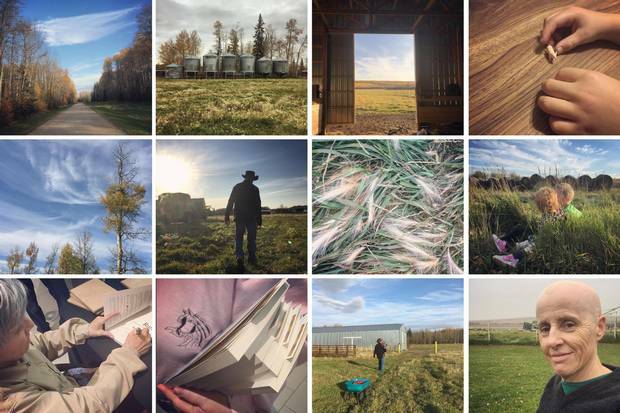 I flew north to Grande Prairie, then left the city and drove across the Wapiti bridge, through the winding and rolling roads to the Crichton farm. When I arrived, we made soup together, chopping carrots and onions in the kitchen. I looked out the window at the pale winter land and sky while the heat and moisture of the soup filled the air. We sat like that until we were ready to talk about that day. The day her husband Sandy died, and everything that led up to it. 2 The farm is a character in their story. Those sweeping fields and northern sky, the animals that feed and support and protect them, the friends and neighbours who live all around. That was their life and their home, and they loved it there. Holly's eldest son, Jason, left when he was 18, but Holly and her youngest, Mat, didn't want to go. They couldn't imagine the life they would have somewhere else, without the things they knew and loved. When Holly and Sandy met, she was a well-known jockey, racing fast and wild, and Sandy was a trainer. The horses, the racetrack, were a huge part of their lives. Even after she was paralyzed in a racing accident, they stayed part of the community. To leave, she felt, would be to lose everything. What would she do in the city? A paralyzed single mother whose life had been spent on the track and on the farm. Through the years, they had learned to survive with Sandy. They did their best to stay away from him, to watch their backs, to deal with it as best they could when he did explode. Everything else about their lives on the farm was wonderful, except for him. They lived that way for a long time, and they were used to it. It was just life. Holly was scared about what he might do if she left. In a way it seemed safer to have him close. They left Sandy a few times, but they always went back home. When Mat had his own accident, vehicles crashing on the highway on a dark winter night, Holly knew the farm was even more important. It gave Mat strength and work and place, and he needed it. Being somewhere else seemed worse, no matter how bad it got at home. 3 The thing you have to understand about Sandy is that he had that rage in him, always. He kept it hidden behind charm and charisma so you couldn't always see it from the outside, but there were glimpses. Flashes of temper he couldn't hide. There were stories that went around, like the time he hauled Holly off by the hair at the racetrack, or how he would yell at Mat at the hockey rink. How he knocked out a dog's teeth with a stick, and beat a cow to death then left her calf to die beside. The longer you spent with him, the more likely you would see who he really was, because he could never keep it hidden for long. But what could you do, even if you knew? Would you step in, or would that make it worse? The thing you have to know about Sandy is that when the racehorse Gypsy Dancer veered off round the corner of the track in Grande Prairie in July 1996 and Holly became a paraplegic in the crash, what she feared most was not her injury but how she could survive Sandy without the use of her legs. Through the years, Sandy drowned Holly until she blacked out. Choked her. Spit on her. Threatened to kill her. Left her with the deep crescent scar that runs across her cheek. He hit Mat, berated him, pulled his hair, chased him in trucks or ATVs while Mat ran across the fields trying to get away. The thing you need to know about Sandy is that his own brother wasn't upset he was dead. He was only upset that Mat had to be the one to do it. 4 The thing you have to understand about Mat is that he hung pictures of chickens in the coop to make his chickens happy and comfortable. That he loved the land and the farm life, and that he only ever wanted all of them, including his father, to live in peace. That there is something about him that connects deeply with people, that makes them care for him like he is a part of their own family. When Mat almost died in a winter wreck on the road to their farm, the community surrounded him the way they had done with Holly after her accident. He came out of a 30-day coma with a serious brain injury, a shattered body that made him work slowly and more carefully, and everyone helped him to rebuild. Everyone except his own father. Sandy went after him harder than ever. What you need to know about Mat is that he wanted to have a happy beautiful life on the farm, and in 2009 he met a nurse named Jenny, who always wanted the same thing. They moved into their own trailer on the farm. They married the next summer, and Jenny told Mat she was pregnant. The thing you need to know about Mat is that he endured the name-calling and threats for himself. He could take being hit, insulted, running for his life. But he didn't want his son to grow up like that. 5 Father and son met in the doorway of Mat's shop. It was Sept. 3, 2010. Mat and Jenny had barely gotten home from their honeymoon when Sandy went after Mat in the field. Sandy was mad, crazed. His eyes flaring wild blue the way they did when he was in a rage. Mat ran into his shop, and got the combination to the gun safe. He fired one shot, to scare his father. To show Sandy that he wouldn't stand for it anymore, and that his own son would not grow up in fear and pain like he had. One shot, with Matti's poor eyesight and terrible aim, but Sandy fell. Like a tree, Mat said later. Like a tree falling to the ground. And then it was over. 6 Mat locked the gun back in the safe and phoned his mother and Jenny. Then he called the police and told them what he had done. He fed the dogs, and got a granola bar and a juice box. Then his brother Jason came to get him, and they sat together on a picnic table in the sun. Mat surrendered to the RCMP who came to meet him at the end of the driveway. He talked to the police and told them everything that had happened. Holly and Jason did, too. They all thought the police would understand once they knew who Sandy really was, once they knew what Mat and Holly had been living with, and what they had all endured from Sandy all those years. They were wrong. The police charged Mat with first-degree murder. 7 The community surrounded them, held them, protected them. A place and its people looking after them again, just as they had before. Women came forward to speak the things Sandy had done to them when they were girls. Abuse they had carried in shame and fear for years, they shared to try to save Mat. One of them wrote a letter to the court which said, "Is it ever the right time to say that you are glad that someone is dead?" Other people filed letters, too. Dozens, then hundreds, in support of Mat, offering that he could stay at their home if he got bail, talking about his kindness and character. The defence had a good case, a strong one. An accidental shooting by a man with a brain injury, after a lifetime of severe, life-threatening domestic abuse. It seemed impossible to believe a jury wouldn't see the truth of what they were living with, and know that Mat hadn't meant to kill his father, that he only wanted it to stop. But the risks were exceedingly high. If Mat was found guilty of first degree murder, he would be in prison for life, 25 years before he could even ask for parole. It was too much of a gamble. He accepted a plea to manslaughter and did his time, the shortest sentence the judge could give him under law. Then he went home to the farm. 8 Percy was born in March, 2011, while Mat was still out on bail. He was tangled in his umbilical cord, no heartbeat and not breathing for 12 minutes at least. The hospital staff did a cooling procedure they had learned a few weeks earlier, but had never performed before that day. The baby survived, but the doctors warned Mat and Jenny of the troubles he would face. A litany of problems and potential disabilities, but none of them happened. Instead, a miracle among tragedies. When I first went to the farm that winter and told their story, he was almost two, a toddler playing around us as we spoke. This month he started kindergarten. He is smart and funny, radiant as he climbs over hay bales in the sun, and rides his bicycle through the fall grasses behind his father. Mat and Jenny had a baby girl, Emmalyn, last year. And she is already bold and brave and full of life. And they are happy. 9 For five years, Holly worked to write her story, putting her family's experience down on paper, to record and examine it. To close a chapter in her life. Her book came out in September. It's called No Way to Run, and she dedicated it, "to everyone who believes that decency and dignity matter." There is a picture of Mat on the cover, his face in shadow, everything toned cold blue. People lined up out the door at the new museum outside Grande Prairie for her book launch on Friday night. Many people bought two copies, or four, or 10. When the books were all gone, her friends started a list of orders and it filled a page and more. People leaned in close and hugged Holly in her wheelchair, getting her to sign their books, telling her what she has meant to them, remembering races she ran and times they had, expressing their respect and admiration. Many people held back tears as they talked about what she and her family have been through, some remembering their own pain behind closed doors. 10 When Jenny's father asked Holly how she could still be positive after going through so much, she described herself like a balloon or a beach ball being bounced overhead, kept afloat by those around her. "There are so many times people kept me up," she said. "I've never, ever been alone." Someone else asked her about the good memories from her life, and tears brimmed in her eyes. She said there were far too many to mention. 11 Holly was diagnosed in June, and had her mastectomy in July. 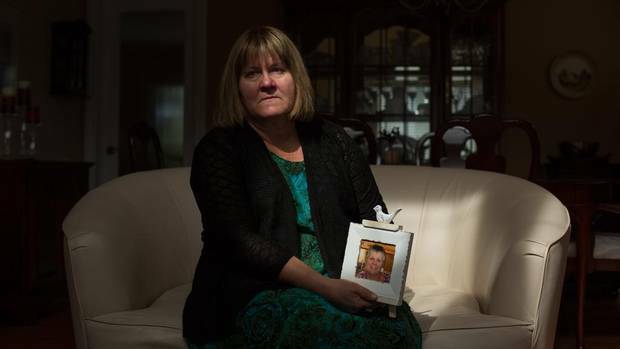 She did one round of chemotherapy but stopped because she felt like it was killing her. She won't do any more chemo. The doctors want her to do radiation, but she is worried the treatment could cause problems with her arm. As a paraplegic, her arms are everything to her. She is as fierce and independent as she was as a young jockey at the racetrack all those years ago. She takes care of herself. To lose strength or movement in her arm, even a bit, would be devastating. She will not go to a nursing home and be dependent on others for her care. She will never do that. "It might have been different even three years ago," she says. But things are good now. Her sons are safe and happy. She knows that Mat will be okay. He has Jenny and the kids, he has the farm. And she has peace. 12 A pot of soup is bubbling on the stove in Holly's kitchen, filling the air with its fragrant heat. It is a cool fall morning at the farm, with mist hanging in the air. The wheat is ready for harvest. There is a chart taped on the cupboard, a graph entitled "Breast Cancer Survival." Holly studies the percentages and predictions, turns the numbers over in her mind as she decides what to do next. Outside, the guardian dogs laze near the flock of sheep. The wind shakes the poplars, gold and orange in the sun, and the seasons start to change again. This story was originally serialized on Oct. 2 on The Globe and Mail's Instagram account (@globeandmail). Follow Jana G. Pruden on Twitter (@jana_pruden) and Instagram (@jana_pruden). 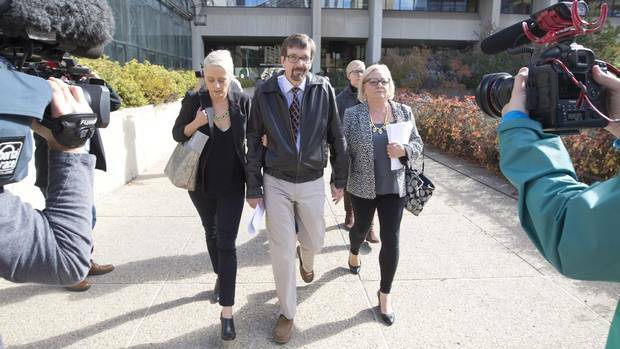 How the Vader case was clouded by missteps and mistakes A case that began with a serious mistake by the RCMP in 2010 was overshadowed by doubts about the verdict.